Sharing that state of a “single page application” via social media/email/instant messaging platforms can be problematic unless the URL can change when the state changes. To handle the first two issues, the first-render of the application should be done by the server instead of the client. This will allow users to see the page data immediately while the page loads all the assets, increasing the performance of the page at load time. Also, as the state of the page changes, the URL should also change. If the user wants to share that change, then it’s easy as sharing that URL. And since the first-render of that page will be done by the server, you can program the server side code to have the application give appropriate Facebook Open Graph and Twitter Card meta tag information on first load that reflects that change to social media sites to make sharing nicer. If you are confused about the power of this, let’s look at some simple examples. If you take a look at the navigation markup, you will see that the links will submit a query string that would be identical if the form were to submit. Since the links have a class of pp-link, progressive-pushstate will know to override the browser’s default behaviour and handle the links. Since the form has a class of pp-form and has data-pp-events set to "change", progressive-pushstate knows that it must fire when any of its fields change. // Use me to avoid using .bind() all over the place. // rest of the logic is here. Note the submit button with the className pp-no-support-button. We want users to press this button if the browser doesn’t support progressive-pushstate. This will allow the page to submit the form data the old fashioned way so that the page can generate the right HTML on the server. If you look at the code for example01.php, you will see PHP code that does this (this PHP code also does the first render of the page). The classes pp-support is set on the <html> tag by progressive-pushstate when the page loads if the browser is supported by the library — if not, the library sets the pp-no-support class instead. If you use the navigation functionality in the above example to go to several pages, try hitting the back button. You will notice it remembers history perfectly. This is because pressing the browser history buttons (i.e. 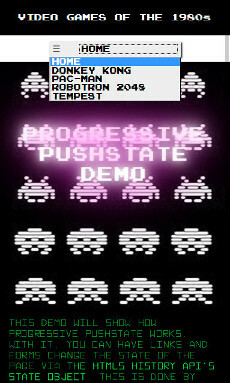 back and forward) will also invoke the popstateEvent as well. History management happens for free! This basic search form will go to the server while the user is typing in a search term. Look at live version of the search example. placeholder="Please enter in a country." Since I am currently working on an accessibility project with my current client, I wanted to build a page with a table that listed all the Web Content Accessibility Guidelines with a way to filter them by principle (Perceivable, Operable, Understandable and Robust) as well as level (A, AA and AAA). A screen shot of the table filtering example. Look at live version of filtered table example. Note the submit button at the end of the form. Unlike the previous examples, the content only changes when we submit. This is to ensure that this page conforms to the WCAG 2.0 (specifically, 3.2.2 – On Input (Level A). We force progressive-pushstate to only allow state changes when the form submits. This is done by setting the form’s data-pp-events to "submit"
If you are using progressive-pushstate to create an accessible website that complies with this international standard, you must do this if you are providing a submit button to initiate a change of context. Note that change of content is not always a change of context. When coding isomorphic applications, developers should ensure that the client and the server both display the same data for each URL. For example, the AJAX requests used in examples #1 and #2 return HTML. This is the same HTML that would be inserted into the page by the server for that page’s state. We do this by using PHP’s include to call the same PHP code that the AJAX request calls. Do I Have To Use progressive-pushstate To Make My Applications Isomorphic? The Redux document on server rendering also has a great write-up on how to do this. 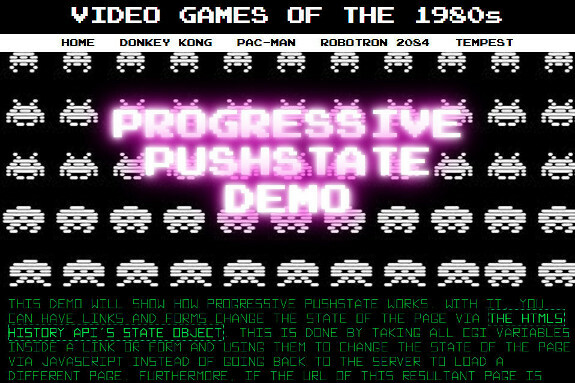 There are more features to progressive-pushstate than shown in these examples. A full breakdown is available on the progressive-pushstate github page. One thing I would think would be great is if instead of using standard query strings (e.g. http://domain.com/page?a=x&b=y&c=z) developers could use directories slugs instead, like Expression Engine does (e.g. http://domain.com/page/a/x/b/y/c/z). I did not do this in the first release because the work I do usually involves forms, and using query strings is the default way forms send information to the browser, so it just made sense to do it that way. I definitely want to add both of these features in a not-so-distant future release when I get some extra time. If anyone else would like to work on these or any other improvement, please feel free to send me a pull request. Alternatively, if you don’t have the time to contribute would like to request a different features for this library, please feel to leave a comment below or on the issue page for progressive-pushstate.